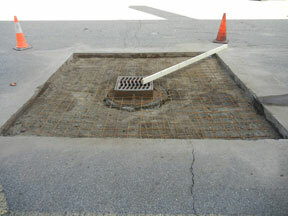 The days are getting longer, the grass is getting greener – it’s that time of year – pothole season in Michigan! Charlotte, Michigan asphalt paving company, Eric Rogers is scheduling parking lot paving and driveway resurfacing throughout mid-Michigan. From Lansing to Howell and Coldwater to Dewitt and all areas between, asphalt paving equipment is primed and ready for travel. Once homeowners and property management crews get a glimpse of green grass following Michigan winters, lawn care and grounds maintenance come foremost to their minds. It’s true, commercial and residential lawn care customers should schedule spring yard cleaning and maintenance right away. However, at the end of a cold mid-Michigan winter, a walk along your asphalt walkways, parking lots, storage and service bays is also in order. Scheduling a commercial parking lot or residential driveway repair consultation in the spring can help get you onto a Michigan asphalt paving company schedule early. Michigan potholes, asphalt cracks, and faded or stained parking lots and driveways can be more than just an eye sore next to that bright spring grass. Asphalt cracks in walkways and potholes in driveways and parking lots can be dangerous hazards for visitors and customers. Retail stores, manufacturing plants, banks, restaurants and medical facilities including senior care homes, with high foot and automotive traffic, can help keep facilities safe with regular asphalt maintenance. Commercial buildings practicing regular asphalt maintenance of their paved walkways, entrances and parking also help ensure facilities meet the Americans with Disabilities Act (ADA) standards. Keeping asphalt surfaces properly maintained can save property mangers and homeowners from large repaving bills in the future. With asphalt patching, and asphalt crack sealing as well as sealcoating the asphalt surface will continue to look new and stay healthy for many years. No job is too large or too small for Eric Rogers. We service large retail, commercial and healthcare facilities throughout the mid-Michigan area as well as apartments, condominium and single family home driveways and walk ways. If you are a property manager, building owner or homeowner, contact us today. Along with asphalt maintenance plans, Eric Rogers lay new parking lots in new construction or renovation sites as well as existing parking lots and driveways. Contact us today to set up a consultation and get on our schedule. Working with a reputable Michigan asphalt paving company will protect your investment and bring lasting results.